Dear guests, our apartment is 60m² large, offers optimal comfort for 6 persons. 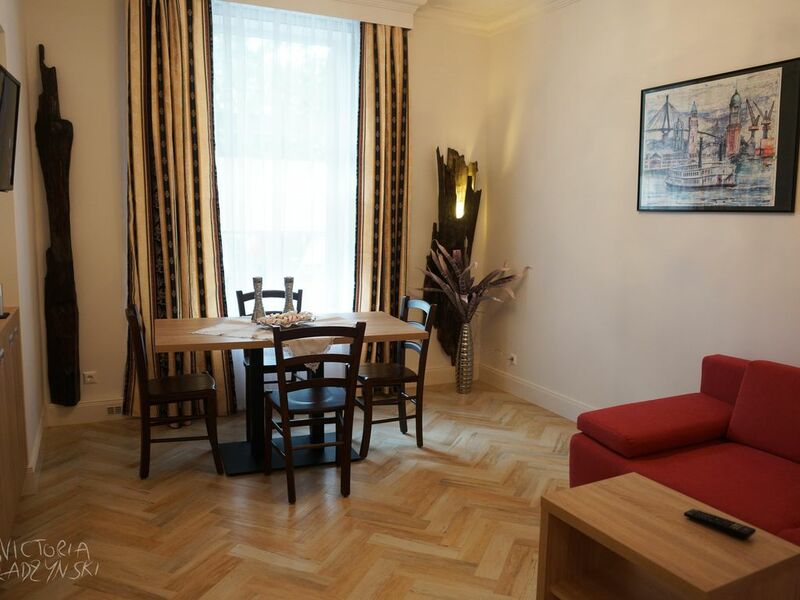 The apartment is located in an art nouveau building and is completely renovated. The floor is laid out with parquet tiles. Both bedrooms are equipped with 2 single beds which can change in no time in double beds. The bedroom 1 is a direct access to the wardrobe. The living room offers 2 additional beds, also there is a dining table with 6 comfortable seating. In the apartment there is a very nice bathroom with a window, a semi-circular shower, heated towel rail and a large mirror. An additional guest toilet is also available. Together with a colleague, we went for a Wind Expo that was held just a few blocks from the apartment. As all hotels near were fully booked, the apartment was our only option. At the beginning I wasn't so sure about sharing an apartment with someone, however, I can say with confidence that we were much more comfortable than in a hotel. Not only the apartment is it's brand new, with all necessary appliances (and more! ), very spacious, the rooms are very well separated, the bathroom is impeccable, very easy to keep it clean and is extremely well located! There is even a organic market one block from the apartment and all sorts of restaurants and bakeries. Besides the lovely apartment itself, we were extremely happy with the warm reception by the owner. This apartment will always be my first option whenever I go back to Hamburg for work or vacation. Nice and close to the e hibition centre and close to restaurants. Beautiful and well kept, clean and comfortable. The apartment was great, light and spacious, the apartment had very comfortable mattresses and very nice bathrooms which, given the uncleanliness of the apartment floors, was surprisingly clean and well appointed. Kitchen equipment was a great bonus. The hair dryer and towel warmer were very nice touches. The apartment is very well situated for young people. Lots to do in the neighborhood. The district is a bit on the outside, but very nice with lots of restaurants around, a very relaxed vibe on the streets and lots of green area's to play. Public transport brings you easily around town. The owner is on top of things and is friendly and attentive to his renters. This apartment was beautifully finished, although the foyer was quite messy (perhaps that part of the building is not yet renovated). The motorized blinds were great for keeping any noise and light out, and here we enjoyed our best sleeps of our 6-city trip. Our apartment is located in the center of Hamburg. Due to the proximity to the university, the trade fair and congress center, the apartment is interesting for business people who prefer a hotel stay an individual atmosphere. The Dammtor intercity railway station is minutes in 5- 10th within walking distance. The apartment is to be in the immediate vicinity of the Jungfernstieg where many shopping experiences on offer. Numerous restaurants, bars and cafes are in 5 min. within walking distance. 120 € für 2Personen, jede weitere Person 30 € pro Übernachtung. Check in ab 15 Uhr am Wochenende nach Vereinbarung.